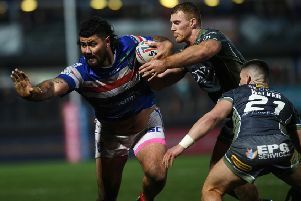 Wakefield Trinity have named their 19-man squad to face Warrington Wolves on Friday evening. Two changes have been made to the side picked to face Widnes Vikings last week with Tinirau Arona and Kyle Wood making way for James Batchelor and Keegan Hirst. Trinity 19-man squad: Matty Ashurst, James Batchelor, Mason Caton-Brown, Anthony England, David Fifita, Liam Finn, Scott Grix, Ryan Hampshire, Keegan Hirst, Justin Horo, Craig Huby, Tom Johnstone, Ben Jones-Bishop, Danny Kirmond, Reece Lyne, Jacob Miller, Pauli Pauli, Tyler Randell, Bill Tupou.